Herve Leger sale on HauteLook today! Luca Luca is having their annual sample/stock sale. Prices up to 75% off dresses, sportswear, and more. Cash or CC. All sales final. No children, no strollers, no exceptions. Splendid and Ella Moss are having an all-out sample sale in LA for the entire family: womens, mens, and kids. All sales final. Cash or CC only. Some sandals on Endless.com are marked down 30%, and Bing.com happens to be doing a 20% cashback right now. So..
2. Search for "Endless shoes"
Hopefully you find something you like! Ends Monday, May 31. HerRoom.com has bulked up their clearance section. Up to 70% off. TheOutnet is doing +40% off 'sunshine colors'... um, light colored clothing. Decent selection, unlike their pretty horrible skirt sale last week! If you have some close ties with your local boutique, you'll probably have pre-saled already, but it's not too late to dip in and see if there's anything good left before the masses are let in on the action! The Gucci SS sale (which is 40% off) goes live online and in-stores on Tuesday, Jun 1. If you love Y-3, it's 30% off at Philadelphia Boutique Joan Shepp. The sale started today. Woodbury Common (and I would think all other Outlet stores) are doing a big hurrah this weekend. Expect to see additional discounts on sale items, and some stores even have store-wide 20% off. If I didn't have something keeping me in the city everyday, I would definitely go. ESPECIALLY to the Catherine Malandrino store. Damnit! My fav deals below, or check out the Woodbury Common sale page. 50% off many Summer styles. *Redeemable for merchandise only. May not be combined with any other offer. Discount may not be applied toward taxes, shipping and handling, monogramming and engraving, alterations or personalization. Not valid on previous purchases or for the purchase of the Gift Card. If you return some or all merchandise, the dollar value of this promotion is not refunded or credited back to your account. Void in states where prohibited by law, no cash value except where prohibited, then the cash value is 1/100 cent. Buy 2 items and receive 20% off purchase. Taxes, alterations and delivery charges excluded. Sale represents a percentage off already reduced prices. Not applicable to fragrance products, gift certificates, and clearance items. Cannot be combined with any other offer. No adjustments to prior purchases. Save an additional 25% on selected Men’s and Women’s Spring/Summer Collections. Prices as marked. Sale is valid on select items only and for a limited time while supplies last. Cannot be combined with any other sale or offer. Certain restrictions apply. Must purchase a full priced women’s or kid’s tracksuit to qualify for the free gift. Select styles, limited quantity of free tees. Cannot be redeemed for cash. May not be combined with any other offer or discount. Cannot be applied toward previous purchases. Other restrictions may apply. Limit 10 items per customer· Not valid on gift certificates or previous purchases. Cannot be redeemed for cash or store credit. Valid on full-price and sale merchandise. Not valid on phone orders . May be combined with other promotions. Take an additional 20% to 50% off Spring/Summer collections. Cannot be combined with any clearance merchandise or coupons. When you buy one tee you can get a second for equal or lesser value free. Valid at all US Puma Stores. See store staff for details. 30% off the entire store. Offer cannot be combined with any other offer or coupon. Additional savings not applicable to fragrance or clearance merchandise. Use code "CHERRY10" to take an additional 10% off Tobi.com's sale merchandise for men and women. Ends tonight at midnight. Fine print: if item discount is 50% or more off regular price, item is Final Sale and cannot be returned or exchanged. Take an additional 25% off Kate Spade's sale collection (or, if you prefer, 25% off Jack Spade's sale collection) both online and in-stores. Ends Tuesday, Jun 1. Up to 60% off now, and the selection is not bad. What we've been waiting for: the Nordstrom Half-Yearly Sale. 40% off a whole lot of GOOD stuff for the girls (and the kids). Time to head for your nearest Nordie's. 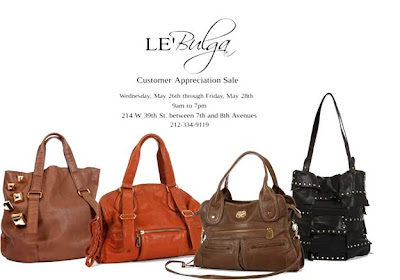 Le'Bulga's lightweight leather handbags will be on a great discount next week during their Customer Appreciation Sale starting tomorrow. Update: they'll take your money however you want to give it: cash, CC, debit card, or even personal checks (with ID)! Glorious chunky trendy jewelry comes your way... at wholesale prices and less, no less. The Ben-Amun (by Isaac Manevitz) sample sale kicks off mid-June. I know tax is included in the price, but I don't know if it is cash only. (I know Alexis Bittar sample sales are cash-only). I'll find out! Inhabit is having another 70% off cotton sale. Not tons of inventory, but some really great prices. It is now tomorrow (officially, although I don't know if the Barney's sale starts at midnight...) 40% off during the Barney's Private Sale. Includes clothing, shoes, and accessories for women, men, and children, and home stuff. Free shipping with no minimum! In-stores as well. 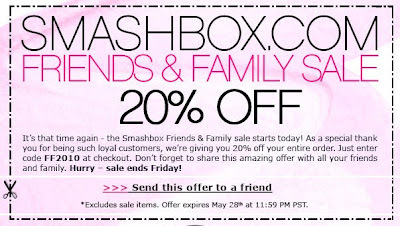 Smashbox is doing 20% off with their F&F event. On anything and everything! Use code "FF2010". Ends Friday, May 28. Shipping is also free via my link. Blue Bee now has a small 90% off clearance section which includes this flowy, summery Moschino Cheap & Chic dress, now $118.50 (retail $1185). SUPER cute if you are Italian size 40 or 42 (US size 6 or 8). Oops,somehow I missed this, but Neiman Marcus' 30% off swimwear promotion ends today! So if you need a new bikini, hop on over. PERFECT timing for me, as I am thinking of what summery skirts I need for the next few months! This weekend's theOutnet promo is an additional 40% off skirts! Today only, Bloomingdale's is having a shoe 'sale' (spend $X take $Y off) but it's got so many damn restrictions that I didn't want to post it at all! But, I figured I should, just in case you are one of the lucky ones. Online: Offer valid May 20, 2010 on regular- and sale-priced Women's Shoes. 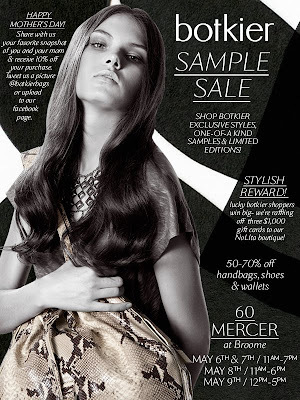 Offer valid in Bloomingdale's Stores. Offer excludes Chanel, UGG® Australia, Jimmy Choo, Tory Burch, Jack Rogers, Giuseppe Zanotti, Fendi, Dior, Nike, The North Face®, Hunter and select styles from Burberry, Havaianas, Bloch, Sam Edelman, Elie Tahari, Alejandro Ingelmo, Boutique 9, Joan & David, KORS Michael Kors, MICHAEL Michael Kors, Lauren by Ralph Lauren, Via Spiga, Corso Como, Salvatore Ferragamo, Stuart Weitzman, GUESS, Converse, Vera Wang Lavender Label, Badgley Mischka, Tkees, Fit Flop and Dolce Vita. In-Store: Offer valid 5/20/10 on regular-and sale-price Women's Shoes. Certain designer and brand exclusions apply. See a sales associate for details. Some Spring items on YOOX are now 30% off! Hmm, should I have not pulled the trigger on the Nina Ricci skirt I bought? I also see (in my Dream Box) that some Stella McCartney tops I was eyeing have gone down. Tempting. Ends Sunday, Jun 7. Update: it works for Rachel Roy New York items as well! Hurrah!! When I saw the subject line of the email "Rachel Roy Friends & Family" I was really excited! But alas, the 30% discount is just for the Rachel Rachel Roy line, which, although fun, is not what makes my heart go pitter patter. But maybe it does for you. Some things to peruse. Not tons, but some of it is pretty darn cheap. Oh holy hell I did not need to see this in my inbox!!! Endless.com is doing 20% off their inventory for F&F. Use code "MYFRIEND". Ends Thursday, May 20 at midnight (so technically Friday). P.S. Bing.com cashback is also currently 20%. It may not work, but it's worth a try!! Restrictions: Minimum purchase of $100 required. Offer may not be combined with any other promotions noted as "special offer" on the item's product detail page. Offer does not apply to the following brands: ASICS, Brooks, Callaway, Dansko, ECCO, FitFlop, FRYE, Giuseppe Zanotti, Hunter, Marc By Marc Jacobs, Michael By Michael Kors, Mizuno Running, Patagonia, Prince, Reebok, Stuart Weitzman, The North Face, Wilson, and excludes watches from: ESQ by Movado, Citizen, Seiko, Bulova, Caravelle by Bulova and Pulsar. The entirety of Beauty.com is 20% off. I've need a new hair dryer, but I'm debating the T3 Bespoke v the Sulta. Any opinions? Ends Friday, May 21. If you have some cash laying around for a jacket, leather or otherwise, it's time to get happy. Mackage is having (I think) their first NYC sample sale. The only Mackage sale I've ever heard of is in Toronto! So gather your greenbacks for some FW10 and SS10 coats, trench coats, and leather jackets. Now I'm glad I didn't order anything online-- I can just go and dig through the real deal. Up to 75% off Steven Alan for men, women, and kids. They'll also be throwing in some Rogan, Olivia Harris, Rachel Nasvik, Sunshine & Shadow, Gryson, and Loomstate into the mix. Woo Hoo! Time for some new tops! Per Racked.com, Elizabeth & James will be having their sample sale of SS10 and past season items. theOutnet.com has unleashed their McQ collection. Better click fast! Mara Hoffman's annual big sample sale is upon us. SS and resort collections (including dresses, tops, and bottoms) will be up to 80% off. Resort swimwear up to 75% of retail. Eberjey will be hosting their 2-day sample sale of lingerie and swimwear! No idea what the discount will be. It'll be good to hit this up in conjunction with the Yigal Azrouel sale. While visiting my friend in Nashville last year, I found a great Yigal Azrouel studded belt at a boutique but couldn't bring myself to throw down $300+ for it (it wasn't even all leather, but mostly nylon elastic). Maybe I should check out the Yigal Azrouel sample sale, which is clearing out their mens and womens SS and resort collection at up to 75% off. 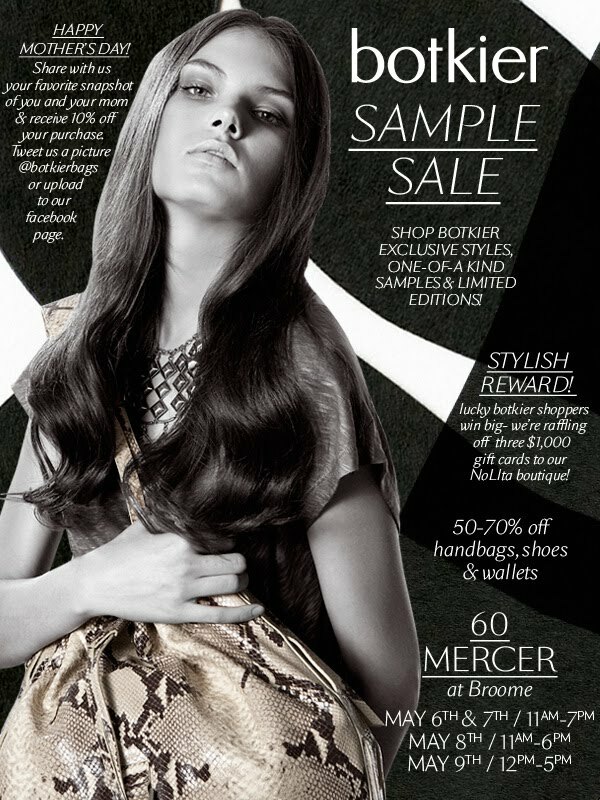 From now through Wednesday you can pre-sale the goodies at Hugo Boss. Then, if you pick it up Thursday night, you get an extra 10% off. I'm a sucker for Boss dresses, so I think a trip to Time Warner Center during my lunch break tomorrow is in order! 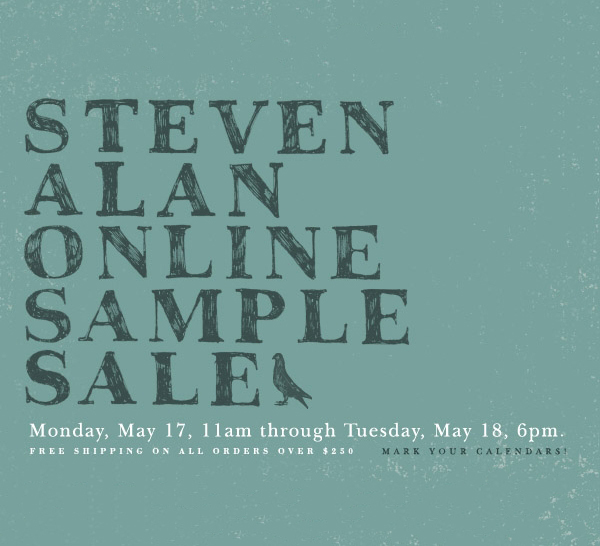 On Monday and Tuesday, get ready to snap up some shirts during StevenAlan.com's online sample sale. 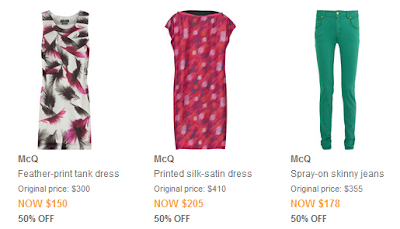 For today at noon, theOutnet is doing an extra 40% off less-formal dresses! TheOutnet has gotten a new shipment in. Some Chloe, Stella McCartney, and Pucci. Update from a commenter! It *may* be worth the effort to try and get in for sizes 35-37. Hmmm, do I dare? And going on since Monday?? Why were those Glamour girls tweeting about 6:30 AM or some crap like that? I would just say if you want to go, be prepared! They know that 'public' day is tomorrow, so they might be extra-vigilant in minding their guest list. "just got back - if you are a size 35 - 37 you so in luck. very hard to get in - they really want your name on the list. but at 2 there was no line out the door. also - it has actually been going on since monday." Update: FYI, I have it from a very good source that they will not be letting the public in to this sale. If you're not on the list, you're not getting in. They just don't want to deal with the crowds. Even more so than the Manolo sale, the Christian Louboutin sale has traditionally be shrouded in secrecy. And unlike the Manolo sale, they have not let the public in on the goods (well, until last year, but I bet if you asked they would still deny it). Racked.com is all over it. Thank you for your RSVP. The list for the Christian Louboutin PRIVATE, INVITE ONLY sample sale is now closed. Um, okkk. Pretty angry. I'm thinking that they will not be lenient like Manolo, so if you want to go, you better be a really good sweet-talker. Today and tomorrow ONLY, Neiman Marcus is taking 30% off a LOT of good stuff. And when I say good stuff, I mean you need to get yourself a Herve Leger dress. Or some Wolford tights. Whatever. But get something good because 30% off hot in-season items doesn't happen very often. Another pair of Loubs popped up on YOOX.com! Priced at $385 (which is probably only a smidge more than you'd find at their now-closed-off sample sale), it's a great summer shoe, and while the description says "acid green", I'm thinking bright yellow is probably more the color, which is perfect for summer! But I suppose if it IS acid green there's always the return policy! Plus, shipping is free right now, so if you wear sizes 35.5, 36.5, or 38, you might want to think about it. At 11AM EST Ivory Trunk will be having a designer handbag sale. In the past they have done great sales with Coach and Chloe, so I'm very keen to see what they've got today! And, unlike other sites, they have a return policy! Online now, and a damn good deal too. Ends tomorrow, Friday, May 13. Today BDB is having a sale on 'vintage' (read: used) Gucci bags. Usually for these sales their prices, although low, aren't half bad. Just FYI in case you're in the market. They will also have Paul Smith sunglasses for women. 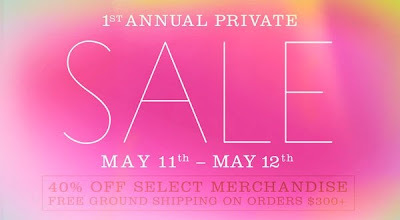 Through this link only, access the Ella Moss online private sale. 40% off a nice bit of inventory today and tomorrow only. Free shipping for $300+. Ends Wednesday, May 12.
theOutnet just got in a shipment of Y-3 - up to 70% off! I've been to sample sales here before, and they've been ok. Good amount of inventory, but the prices never blew me away. This time around they will have women's RTW, outerwear, handbags and accessories from Alexander McQueen, Anna Molinari, G.F. Ferre, Just Cavalli, John Galliano, Love Moschino, M, RED Valentino. Prices up to 70% off. Perfect timing! I have a couple of weddings I must attend in the next 2 months and the couples' registries have been picked over. The Christofle sale will have flatware sets, holloware, crystal, porcelain, frames, gifts, and jewelry, all up to 70% off. I'm thinking a silver platter for my boss, a crystal bowl or silver frame for my neighbors, and some jewelry for me. At past sales, I've gotten crystal tumblers for myself as well as little gifts for others, like silver bookmarks or little candy dishes. The sale will also feature Guy Degrenne commercial-quality tableware, stainless/silver flatware, holloware, chafing dishes (for all you caterers out there), trays, porcelain, and glassware. Also up to 70% off. Shop for charity's sake! Lighthouse International is hosting its annual POSH Fashion sale, a four-day sale of thousands of items, including new and gently worn clothing, shoes and accessories for women, men and children. Notable names supporting the cause: Carolina Herrera, Christian Lacroix, Oscar de la Renta, Ralph Lauren, Manolo Blahnik, Coach, Burberry, Douglas Hannant, Furla, Rachel Roy, and there will be clothing donated by Vogue’s Hamish Bowles. No idea as to whether those clothes will be his own or goodies from the European Vogue closet. POSH benefits Lighthouse International, a leading non-profit organization dedicated to fighting vision loss through prevention, treatment and empowerment. New items are replenished daily, and tickets are $10/day or $30 for all 4 days. Of course this wouldn't be a NYC event without a special soiree and VIP preview, and those tickets can be had for $175. Founded in 1905, Lighthouse International is a leading non profit organization dedicated to fighting vision loss through prevention, treatment and empowerment. It achieves this through clinical and rehabilitation services, education, research and advocacy. For more information about vision loss and its causes, contact Lighthouse International at 1-800-829-0500 or visit www.lighthouse.org. Time to check the Dream Box! Select SS items are now 20% off on YOOX!. And they are still running their free shipping promo, but it all ends Monday, May 17. To celebrate the 1 yr anniversary of their website, Shu Uemura is doing 20% off plus free shipping on $50+. Use code "HAPPY". Perfect for those of us needing to stock up on cleansing oil! Not a ton of new items in their 60% offsale section, but you could always get lucky. 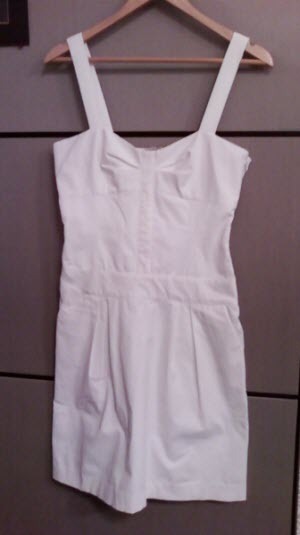 There's a nice selection of dresses, and some jewelry that's even more heavily discounted, but the 7 for All Mankind ruffle front shirt is adorable! Well, until Tuesday, May 11 MyTheresa is offering 10 Euro international shipping, which comes out to about $12.75. Not bad, so I pulled the trigger on some YSL boots which were marked down to $372 :D Not to be insensitive, but I am really celebrating the fact that the Euro is coming down!!! Now I can finally take a vacation to Europe! But, I found out after-the-fact (after some internet research), that I should expect to pay customs via DHL, which could be anywhere between 14-18%. Boo! Adding another potential $66 would make it less of a deal, but they are so cute, no? YOOX.com is doing free shipping through Monday, May 17. On ANYTHING! Hurrah, that's an instant $9.50 savings-- time to check out my Dream Box! P.S. - I did notice that a few of my items got discounted FINALLY (like Nina Ricci). So maybe some of your stuff did too! P.P.S. - I got a couple of La Perla bras--- GREAT prices on those, as well as some cute La Perla bikinis. Which I would have gotten, if ever I went in the sun. Update: oh noes, DON'T GO. Commenter Riri gives us the d/l. Thank you, Riri! Ok been there this morning 11 am....oh my NOT WORTHY ! first of all they didnt have my size! 41/11 ! and the girl try to sell me the 40s..i didnt like that, i think i know my feet size! very few selection and ooooollllldddd stylessss you find better paciotti shoes at department stores sales. so now you know! Um, hello, awesomely fashion-forward shoes at a $100 starting price point? (Retail $780+). Daily Candy has released a fab list of sales for next week including MaxMara, Showroom Seven, Lela Rose, Tocca, Opening Ceremony, Nanette Lepore, Noir, Melissa shoes, Araks, and Twinkle by Wenlen. Why: Summer clothing is 60-80 percent off; dresses are $199-$299 (reg. $995). When: Mon.-May 14. Mon.-Thurs., 9 a.m.-6:30 p.m.; Fri., 9 a.m.-5 p.m.
Where: 317 W. 33rd St., b/t Eighth & Ninth Aves. Why: Up to 90 percent off Orla Kiely, Erickson Beamon, Charlotte Ronson, and more. When: Tues.-May 21. Mon.-Fri., 10 a.m.-7 p.m.
Where: 263 Eleventh Ave., b/t 27th & 28th Sts., 3rd flr. Why: Score 60-85 percent off fashion, beauty, and baby items. When: Wed.-Fri., 11:30 a.m.-7 p.m.
Why: Cashmere boyfriend cardigan is $195 (reg. $550) and the ribbon-strip skirt is $250 (reg. $695). When: Wed., 9 a.m.-7 p.m.; Thurs., 10 a.m.-6 p.m.; Fri., 10 a.m.-5 p.m.
Why: Printed silk skinny-leg pants are $80 (reg. $214) and a silk drop-waist dress with plunging neckline is $130 (reg. $341). When: Thurs. & Fri., 10 a.m.-7 p.m.
Why: The ground zero of fashion is offering 60-90 percent off Rachel Comey, United Bamboo, Vena Cava, Proenza Schouler, and more. When: Thurs.-May 16. Thurs.-Sat., 11 a.m.-8 p.m.; Sun., noon-7 p.m.
Where: 33 Howard St., b/t Broadway & Lafayette St.
Why: Skirts are $95 (reg. $195-$295), pants are $95 (reg. $210-$295), and dresses are $150 (reg. $335-$595). When: May 18-20. Tues.-Thurs., 9 a.m.-7 p.m.
Where: 225 W. 35th St., b/t Seventh & Eighth Aves., 4th flr. Why: Bedazzle and bejewel your hair with $40 headbands (reg. $150) and miscellaneous $10 accessories (reg. $175). When: May 19 & 20. Wed. & Thurs., 10 a.m.-8 p.m.
Where: 594 Broadway, b/t Houston & Prince Sts., ste. 1216 (212-941-9588). Why: Statement jewelry (pavé octopus ring, stackable pyramid rings) is up to 80 percent off. When: May 19-21. Wed.-Fri., 10 a.m.-7 p.m.
Where: 350 W. 38th St., b/t Eighth & Ninth Aves., 5th flr. Why: Stylish plastic shoes designed by Vivienne Westwood, Alexandre Herchcovitch, and others are now $20-$150. When: May 19-22. Wed.-Sat., noon-8 p.m.
Where: 520 W. 27th St., b/t Tenth & Eleventh Aves., ste. 601. Why: Up to 75 percent off clothing and lingerie, and swim sets are $40 (reg. $228). When: May 20 & 21. Thurs., 8:30 a.m.-7:30 p.m.; Fri., 9:30 a.m.-6:30 p.m. Starting at noon, theOutnet will be doing +40% off lightweight pants and shorts. Very timely! Looks like there will be offerings from Chloe, Stella McCartney, Helmut Lang, and Calvin Klein. The Barney's purple card has long been a well-loved tradition. Basically you spend $X and get a giftcard for $Y just like most other deals. Not a HUGE savings, BUT the Barney's promo has virtually no exclusions, and they carry brands like Balenciaga, Valextra, YSL, Bottega, etc. Ends Sunday, May 9. Just FYI, theOutnet.com got some new goodies in! A lot of Valentino and Alberta Ferretti and a few gorgeous pieces from Temperley and Notte by Marchesa! BG's sale is also online as well as in-store. 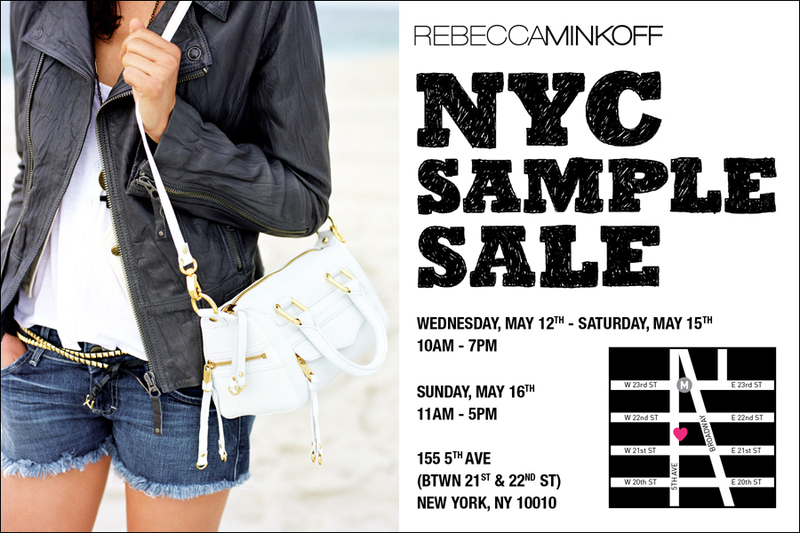 FYI Rebecca Minkoff fans-- I know there's a big sample sale next week, but there's a lot of her bags on sale here. Girls who love Vivienne Tam -- you must go to this sample sale. And if you are a sample size (size 0-4) or her equivalent sizes 0 or 1, you MUST go! The sale is 75% samples and 25% overstock with some shoes and totes as well. As my new year's resolution, I've lost 15 pounds and NONE of my clothes fit anymore. This is both good news and bad. Good because I can wear size 27 jeans, but bad because I've amassed this huge designer closet of size 6 clothing that I can't wear anymore!! SO, with great relish I attacked the racks and racks of samples! Lots of dresses, some tops, and some little jackets, all priced between $40-90. It's not super organized, so you'll have to do some searching. 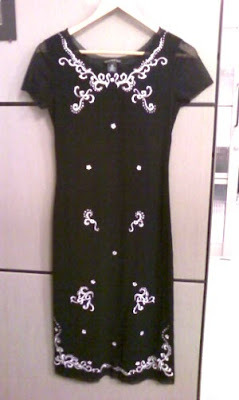 I scored a gorgeous black fitted dress with white embroidery (which I think I'll wear to my boss' wedding) for $85 ('retail' $400) and a white cotton day dress for $60 ('retail' $375). I also got a little black shrug/jacket for $70 ('retail' $275). I say 'retail' because although they are priced out on the tags, obviously they were never on the showroom floor. The samples are all high quality-- finished zippers, clean seams, no tears. Some of them do have stains, so you'll have to be careful. And since they are samples, there are very few pieces of each item. The woman at the counter let me know that they WILL be restocking the samples, although not the overstock. The overstock includes tops, dresses, pants, and coats all priced between $75-180. There were some really gorgeous dupioni silk dresses that sold on the high end ($180) and cotton fabric day dresses and ruffle-y dresses that sold for less ($120-160). Overall a fabulous place to go for dresses!! The tops were ruffled or embellished and still around the $70-80 mark. They all have Vivienne Tam labels sewn in, but they will cut the price tags off when you check-out. There is no dressing room, so be prepared to strip down! It wasn't very crowded when I went during the lunch boom, and there are a lot of Asian women there working who will help you zip up and tell you if it's too tight. Other than clothing there is a small selection of summer sandals (mostly chunky heels) for $70 and floral totes for $70. No sales tax on items under $110 and they take credit card. As I mentioned, they are restocking samples, so I am definitely thinking of a return trip! Friday is the last day, and for that I was told they usually discount 20% off your purchase of $500+. A 1.5hr lunch break well worth it!! YOOX is running a Marni promotion! Use code "YOOXLOVESMARNI" for an extra 20% off all Marni plus free shipping. Ends Friday, May 7. FINALLY a ShopBop code!!! Use code "INTHEFAMILY15" to get 15% off full-price and sale merchandise. Ends Wednesday, May 5. TheOutnet has gotten a new shipment of Anna Molinari, one of the hottest Italian designers. Intrigued? I actually am unfamiliar with the label, so I went on YOOX and did some recon. I think this could be the beginning of a beautiful friendship. I feel like I hear about a J.Crew sample sale every month. I guess NYC is their dumping ground. Mens, womens, and children's clothing in all sizes, shoes, and jewelry. This includes everything from tank tops to blouses to sweaters to sneakers to sandals to boots. It sounds like a total hodgepodge of J.Crew heaven. Vivienne Tam has done a lot of promo on Mintbox, so I've often wondered how the company is doing. I hope it's solvent! I'm going to try and make it to this sale-- 75% off her clothes is a great deal. Awesomely cheap cashmere finds have long haunted the White+Warren sample sale lore. Some of the goodies promised at their spring sample sale: cashmere duster $100 (retail $250), lightweight cotton cardigans $50 (retail $110). If you are a Rebecca Minkoff fan, you'll be happy that there is no 'VIP preview' to this one (well, at least that I know of). First come first served! No details on selection and price points. If you heart Botkier, plan on heading to their sale of exclusive styles, limited editions, and real samples. It will be 50-70% off bags, wallets/accessories, and shoes! I'm pretty excited because even though I don't carry Botkier bags, I've really started liking their heels, which I've gotten from Endless.com. To keep it fun and light-hearted, they'll be raffling off 3 $1,000 giftcards and if you send them a photo of you and your mom either via their Facebook page or Twitter (@botkierbags), they'll give you an additional 10% off! How cute is that? Housing Works’ is having their sixth annual Design on a Dime event which will raise funds for Housing Works’ newest residence for New Yorkers living with HIV/AIDS, the Jefferson Avenue Housing Program in Bedford-Stuyvesant, Brooklyn. For Design on a Dime, 50 of the world’s top interior designers create unforgettable room vignettes with new merchandise, donated and available for 50-70% off retail. Last year’s Design on a Dime raised nearly $500,000 for Housing Works, New York’s largest community-based AIDS service organization. So if you need to come decorate your pad with some trendy stuff, open your wallets b/c it's for a good cause! Those eager to get their hands on a chair that Daniel Craig sat in can buy tickets to the VIP sneak preview on Thursday, May 6. Tickets are $150+ and include a silent auction of 100 framed photographs and artworks, including pieces from Zatista.com, The New York Photo Festival and Soho Photo Gallery. Participating designers Jaclyn Smith and Ty Pennington will both be on hand for the event. More about the cause below. The Jefferson Avenue Housing Program, the beneficiary of this year’s Design on a Dime, will provide 12 apartments for homeless New Yorkers living with HIV/AIDS. Located in Bedford-Stuyvesant neighborhood, one of the New York communities hardest hit by AIDS, Jefferson Avenue is slated to be completed by 2012. Founded in 1990, Housing Works has provided lifesaving services such as housing, medical care, meals, job training, legal help and HIV prevention education to more than 20,000 homeless and low-income New Yorkers. All Housing Works Thrift Shops profits go to Housing Works. For more information, visit www.housingworks.org.